A & S Bagels has a proven track record for excellence in both product and service. Our wholesale and commercial clients include bagel shops, food distributors, convenience stores, bakeries, hospitals, supermarkets, hotels, delis, educational institutions, country clubs and cafeterias. Our bagels can be purchased wholesale for resale. Wholesale Buying means to purchase large quantities of an item (buy in bulk) at reduced prices with the goal of re-selling or serving the product to the end consumer. Accordingly, A&S Bagels sells our bagels in large quantities at reduced prices. Please e-mail us at bagelmail@aandsbagels.com to arrange for deliveries. DAILY DELIVERY SERVICE is available for LONG ISLAND and NEW YORK CITY METRO AREA BAGEL shops, delis, bakeries, hotels and other food service institutions. We can arrange deliveries to be made to your location 7 days a week. WEEKLY, BI-WEEKLY AND MONTHLY DELIVERY SERVICE is available for most bagel stores, bakeries and food distributors in the continental USA. We can arrange for shipment (by the pallet) of our Frozen Raw Dough Bagels, Frozen Fully Baked Bagels, and Frozen Par-Baked Bagels to most areas in the continental USA. A&S Bagels can arrange delivery and distribution of our great tasting bagels to most parts of the United States. Our delicious bagels have been enjoyed throughout Long Island, New York, New Jersey, Pennsylvania, Colorado, Texas, Maryland, Washington D.C., Florida, North Carolina and other great states. A & S Bagels Inc. prides itself in providing superior service to our customers and distributors. We go beyond expectations to ensure our commitment to service is unmistaken. Please e-mail us at bagelmail@aandsbagels.com to arrange for deliveries. If your deli, bakery, bagel shop, business, hotel, convenience store, school, food service company etc. is interested in ordering fresh baked bagels, frozen thaw and serve bagels, frozen raw dough bagels, or par-baked bagels at wholesale prices, please e-mail us at bagelmail@aandsbagels.com or Call us at: (516)326-9288. All bagels produced at A&S Bagels are certified Kosher and Pareve by United Kosher Supervision. You can download the certificate in PDF format by clicking on the appropriate link. Full Baked Fresh Bagels (Not Frozen): Typically we deliver fresh full baked bagels, mini-bagels, bagel flats, bialys and bagel twists to food distributors, supermarkets, delis, hotels, coffee shops, diners, catering halls, bagel stores, bakeries and to other food service organizations. We offer 7 day delivery service to many of our wholesale and commercial customers in the Long Island and New York City area. 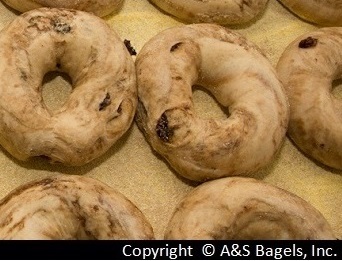 A&S Bagels are "water bagels" meaning that they are first boiled in a kettle before being baked. CALL US: Your deli, bagel store, food distribution business can re-sell A&S Bagels. A&S Bagels sells our bagels in large quantities at reduced prices (wholesale pricing). If you are interested in purchasing bagels from A&S Bagels, please contact A&S Bagels at (516)326-9288. Frozen Raw Dough Bagels: Our premium quality raw dough bagels can be delivered to your bagel store. You will be able to save money on ingredients, machinery and labor. By ordering raw dough bagels from us, you won’t need a dough mixer, a bagel former and bagel divider. All the while, you will be able to bake off premium gourmet New York Bagels, and serve your customers a great tasting consistent bagel. Moreover, customers will be able to smell the aroma of the freshly baked bagels. This is a perfect solution for bagel shops and bakeries. Your job would be to proof, boil and bake the bagels. (Our bagels do not have to be boiled, but traditionally bagels are boiled before being baked). Frozen Par-Baked Bagels: A&S makes par-baked bagels (also known as brown and serve bagels). Our par-baked bagels are partially baked bagels. All you have to do is finish the baking for a few minutes in your oven. With par-baked bagels, your customers can get great tasting hot bagels, while you save on labor and resources. Our Par-Baked Bagels are partially baked bagels, which are frozen, and then packaged 5 dozen per case. The par-baked bagel and the raw dough bagels are finished off (baked off) at your location, so that you can serve hot bagels to your customers. Frozen Thaw and Serve Bagels: Our full baked frozen bagels (also known as thaw and serve bagels) provide the food service industry with an easy way to serve great tasting New York bagels to their customers. Once the bagels are thawed out, they are ready to be served and enjoyed.